Today I am gonna share with you the most EPIC Hike, Longest Hike, Highest Hike, Coldest Hike I ever had in my entire lifetime (till Aug-2017) right now. I actually managed to hike for 9hrs after my FIRST Overseas Half Marathon (21km) at the Tinkerbell Half Marathon. It was crazy. 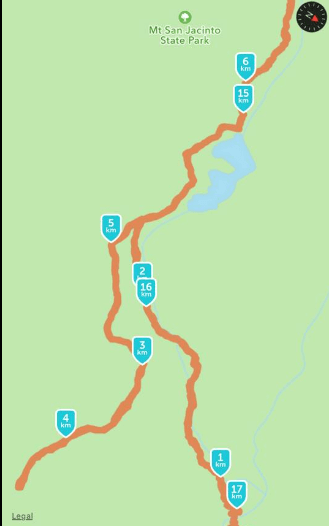 The length of hike is approximately about 20km? 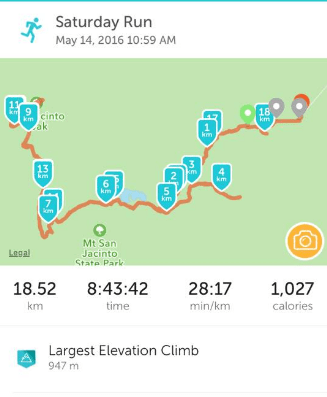 Although I tracked 18.5km only because I started tracking after 1500m into hiking. But if you went the correct way, it will be about 15km to 16km actually because we spend about 2km going the wrong way. 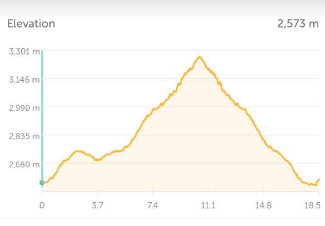 1.5km wasted because we were accidentally brought downhill by a couple who doesn’t know the way at the crossroad. 0.5km because it was dark and we went to the wrong path and we cant find the right exit. 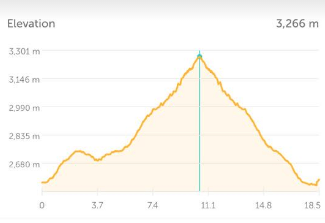 Total elevation we did was 947m, 3106ft (according to RunKeeper App) because we started climbing from the Aerial tramway which have already brought us to the midhill at 2595m, 8516ft. So the peak is 3303m, 10834ft minus off 2595m, 8516ft so we are left with 706m, 2318ft left to do. Let’s us read on and find out more about the EPIC Ice Mountain I climbed last year on 14th May 2016, Spring! We drove from Los Angeles towards Palm Spring on the 13th May 2016. I think it’s a super long journey maybe like a trip from Singapore to maybe Malacca? 2-3hrs probably? We arrived this awkward place. Why I said it was awkward? Because Los Angeles is super cold like 17-18 degrees celcius and I am already wearing a coat. But when we reach Palm Springs, it’s almost 36 degree celcius! I wore a long sleeved shirt to prevent having uneven tan! LOLS! This place is a very ‘Beach’ like place. Very Australian feel which you feel like every shop is selling swimsuits! Palm Spring is also the hometown of many famous artist like Elvis Presley （猫王）. He is an idol of Casper. Then we found my favourite Coffee Bean store so we decided to hop in for a nice cool blended Pure Vanilla. Then we went to our hotel to get ready for the hike next morning. Good morning guys and we are heading uphill to board the tram to hike the famous Mount San Jacinto! The hot and sunny drive up the midhill! It’s burning and scorching. I cant even see the screen at all! This is how far our hotel in Palm Springs Downtown away from the State Park area. A 360degree photo to show you the moment right before go drove up!! I mean up the hill!!! All I can remember, the sun is scorching like mad!!!! Our car become ‘chao-tar’, see black black already. ‘Chao-tar’ means burnt in Hokkien dialect. Overcooked Horsey (Mustang’s logo is a horse). It’s so hot that something bad happened, Casper left a can of drink in the car and when we returned to the car at night, the drink exploded!!!!!! So we spent hours cleaning up the mess to make sure we got rid of all the stains. After we parked our car at the scorching carpark, we took a free shuttle bus up to the Tram station! This cool shuttle bus have no doors! We have already bought our tickets online so we avoided the 10mins queue. I am always thankful to marry a Type A planner Husband who got everything covered. Trust me, I don’t even know our itinerary but he planned everything for us. I just need to bring myself. I don’t even need to pack my luggage because he will pack it for me hahahaha! I always say, the most fortunate thing is to marry a husband who treats you like a child and listen to you like a woman! Most important pay for my shopping bills! Wahahahaha! Thanks Casper for doting on me! I hope Casper actually got some good deals online. But I know even the Fares is $100USD, he will still pay for it because the Scenery is so awesome and we will never regret the time spent in Palm Springs! I am terrified to know the Temperature above is 11-12 degree celcius. OMG! I actually “under wear” I mean under dress. If I am wearing a coat @ 18-19 degree celcius, I guess….. At 11 degree celcius I need to wear Puffer Coat with Fur （羽绒服）!!! Anyway it’s time for Boarding! You can see, there is lots of people joining us today. 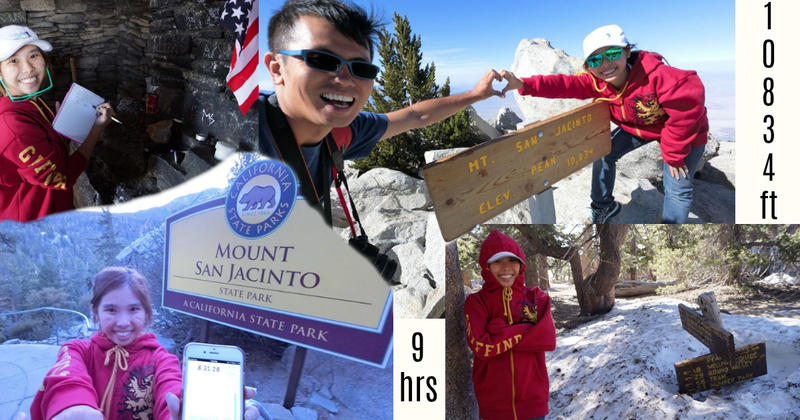 You can visit Mt San Jacinto for not just hiking but for dining, picnic and camping!!! I swear we saw alot of people camping overnight!!! But they are super well-prepared unlike us! If I were to visit Mt San Jacinto, I will also camp there for 1 night! The largest rotating tram arrived!! The view up is sooo amazing and it keeps rotating so we get to see everything!!!! Goodbye Downhill and Hello Midhill!! Yay!!! We love this ride up!!! The friendly crew at the Tramway! As you can see, people are getting their gadgets ready to camp overnight!!!! I AM READY TO HIKE UP! At this point of time, I have not done any research and I thought the Mount San Jacinto is just like any other mountain I did in maybe Malaysia? Can’t be worst than the Hollywood Mt Lee right? Maybe I will be done in 3hrs or 4hrs and we can go and have lunch or something! Before we can start hiking, we must go the Ranger Station to submit our Permit. It’s free for the permit. There is 2 parts to the permit. 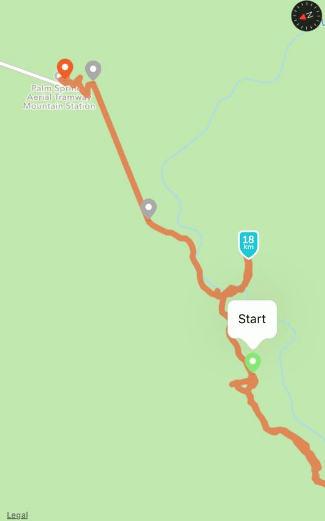 The first part you will submit before the hike, the 2nd part you will drop into the Box to inform the Park Ranger that you already complete the hike and leave the campsite. In the Ranger’s Station there is lots of useful information. Like the time of Sunset. But we definitely can’t watch the Sunset because if the sun setted, we will not have enough light to get downhill and it will be freezing!! 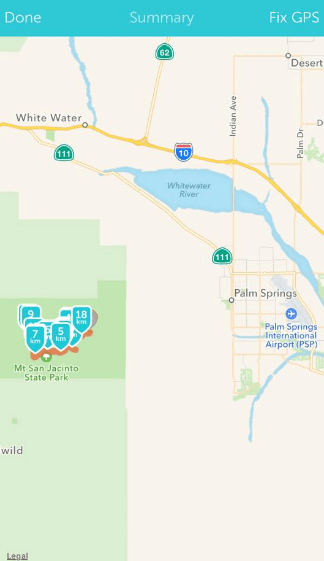 Here are also the 10 essential of hiking in Mt San Jacinto. Apparently we don’t have more than 8 of them. We dont have extra food, we don’t have extra water either. We don’t have thicker and extra clothes and we are in our running shoes. We are so dead! OMG… Mountain Lion sign? Does this means there is Mountain Lion in this Mountain???? I think yes!! Mountain Lion should be found in Mountain la.. If not found where? In the Zoo? No right!!! Mountain Lion can be found in Mac OS too!! HAHAHAHAHA! Then guess what we saw???? SNOW!! We thought there isn’t any snow anymore as informed by the Park Ranger!! But guess what!!! I made a lame joke. I said we found Ice on the Mountain so it’s ICE MOUNTAIN! LOLS!! But it’s a Mineral Water drinking brand in Singapore. This is how WILD we can be in the WILD! The view is really AMAZING!!! It’s nothing I have seen before. Malaysia Mountain or Singapore Hills are more of the greenery kind and Hollywood is more of the desert, orangey kind. But this is like SNOW MOUNTAIN!!! Finally we reach the last lap before we reach the top! There is this amazing hut which signifies that you have almost arrived. So we went into the hut and leave a message for the future us! Remember leave nothing but footprints or a note in every natural attraction. I don’t think it’s right to even vandalise on the stone wall. Lastly we FINISH-ed!! We are FINISHED.. Not exactly but we finish the hike up!!! I felt I was so near the sky, i could touch the sky!!! Yes! Gerlyn Ong, you did it!! I am so proud of you!!! Nice strangers photobombed us at the back with their hands up in the air!! Check out the 360degree view! We stay for about 10mins and we decided to hike down before the sunsets! Nice and friendly hikers helped us along the way by giving us chocolate bars and water to drink. Kindness received in America. It’s getting colder and my hand starts to freeze a little. It’s slippery too. But thank God for my Kayano. It was my first experience with real snow on the floor and stepping on them. It’s unforgettable. My next bucket list is to see snowing right in front of me. We finally reached the Ranger Station again and we returned our permit! Hooray! We did it!!! But we will be back! 7.44pm we completed everything which is 3mins after the sun have setted. Lucky us. Although we losted our way while coming back from the Ranger Station but luckily we heard some footsteps and we followed them so we managed to find our way! You can see, at 18km, we deviated away from the main route. After the hike, Casper treated me to an expensive dinner. I think he had pork chop or something. I had my favourite Salmon too! It’s a very nice restaurant with friendly crew and wonderful ambience. We really enjoy our meal. If I come back again, I will definitely eat the Salmon again! Day 3 is the last day which means it’s SHOPPING DAY!!!! We bought Jackets for my Family Members. A kid size Jacket for my Baby Charlotte. She is the daughter of my BFF Bianca. She is just half a year old during my trip and Bianca told me to buy Toddler Size 2yo for her. Because it was too big, she only get to wear it recently after a year into my trip in May 2016. Love your Gerlyn Jiejie(sister) and Uncle Casper. Baby Jaymond did the same, he told his Grandma, I played with Jiejie and Uncle today. Then my BFF’s Husband also tell his Son Baby Jinshun to call me Jiejie and to play with Jiejie. Until now there is one exception is my BFF Serene’s kids called me AUNTIE!!!!!!! But i guess I would just accept it. Someday I will be Auntie right? Hahahahaha! So thanks for reading! If you are climbing Mount San Jacinto or visit Palm Springs, you can ask me for more information, I will help as much as I could. I hope you have a wonderful trip there. If after reading my post, you are tempted to visit Palm Springs, do let me know as it will really encourage me to write stuff like that more often!